John Pearson was the first metalworker at the Guild of Handicraft, founded by C.R. Ashbee at Toynbee Hall in the East End of London in 1888. Pearson finally left the Guild in 1891 to work as a freelance, having already once been dismissed and reinstated for working for William Morris in his spare time. According to Miss Kotze, who was Pearson's pupil, Pearson sold this dish to the Morris shop, where it was purchased. Years later, Pearson saw it in the Caledonian Road market and vbought it. Miss Kotze purchased it from him. 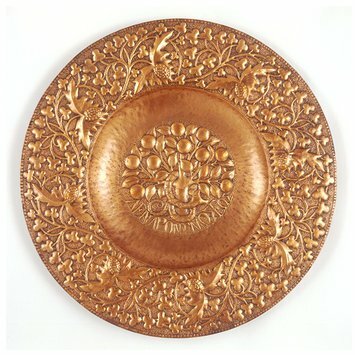 Copper, embossed and chased with the Tree of Knowledge, with a broad border of stylised, floral design. The salver circular, with a single depression containing the embossed roundel of an apple tree encircled by a serpent with textured scales, its mouth open and fangs protruding; worked on a matted ground. Below the tree, in Greek characters, the inscription: The Tree of Knowledge. A plain hammered border which surrounds the roundel is carried up to the edge of the depression. The broad border has an edge of flat topped beads and a scrolling design of stylised pommegranates and trefoils springing from branches, on a matted ground. The inscription in Greek characters: "The Tree of Knowledge"
John Pearson was the first metalworker at the Guild of Handicraft, founded by C.R. Ashbee at Toynbee Hall in the East End of London in 1888 (see Shirley Bury's introductory essay on silverwork in C.R. Ashbee, Modern English Silverwork, new ed., London 1974). Pearson finally left the Guild in 1891 to work as a freelance, having already once been dismissed and reinstated for working for William Morris in his spare time. According to Miss Kotze, who was Pearson's pupil, Pearson sold this dish to the Morris shop, where it was purchased. Years later, Pearson saw it in the Caledonian Road market and bought it. Miss Kotze purchased it from him. Copper, London, ca.1890, designed and made by John Pearson.